A live music experience, featuring iconic movie moments from DreamWorks Animation’s hit films including Shrek, Kung Fu Panda, How to Train Your Dragon and many more. 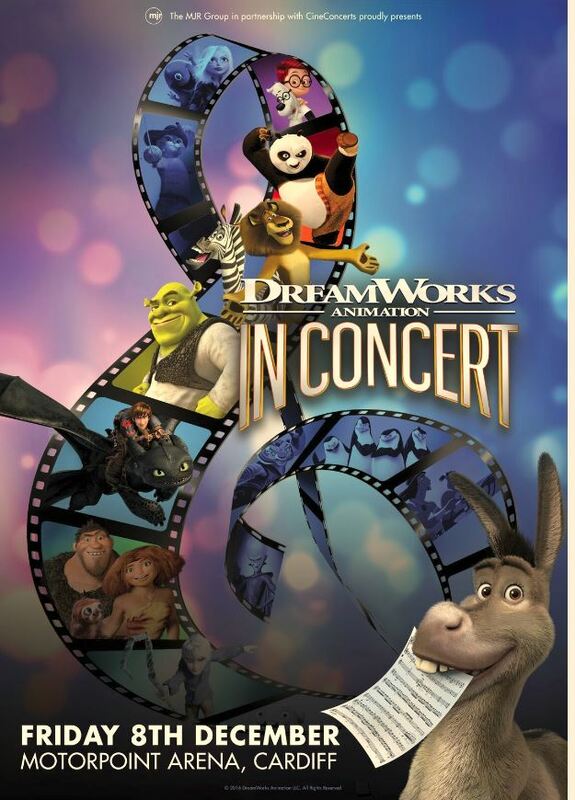 Universal Brand Development and CineConcerts, along with MJR announce DreamWorks Animation in Concert UK and Ireland tour. The concert features favourite moments from DreamWorks Animation’s most beloved films with music performed by the Royal Philharmonic Concert Orchestra in the UK. Enjoy a celebration of more than 20 years of inspired animation and iconic music scores by Hans Zimmer, Harry Gregson-Williams, John Powell, Alexandre Desplat, Alan Silvestri, Danny Elfman and many others. Relive the moments from Shrek, Madagascar, Kung Fu Panda, How to Train Your Dragon and more as they are projected in HD onto the big screen as the music is played live by a symphony orchestra. “We are excited to bring the stunning music of DreamWorks Animation composers to life on stage to be showcased in this great and fun event for music and movie fans of all ages,” said Carol Nygren, Vice President, Worldwide Live Entertainment, Universal Brand Development. DreamWorks Feature Animation (DWA) is a division of the Universal Filmed Entertainment Group (UFEG). Its 20-year feature film heritage includes many beloved characters and animated franchises, including Shrek, Madagascar, Kung Fu Panda, and How to Train Your Dragon. DWA’s 32 feature film releases have generated more than $13 billion at the global box office, garnered numerous awards and fueled a robust consumer products business. CineConcerts is one of the leading producers of live music experiences performed with visual media. Founded by Producer/Conductor Justin Freer and Producer/Writer Brady Beaubien, CineConcerts has engaged millions of people worldwide in concert presentations that redefine the evolution of live experience. Recent and current live concert experiences include The Harry Potter Film Concert Series, Gladiator Live, The Godfather Live, It’s a Wonderful Life in Concert, DreamWorks Animation In Concert, Star Trek: The Ultimate Voyage 50th Anniversary Concert Tour, and Breakfast at Tiffany’s in Concert. Justin Freer has quickly become one of the most sought-after conductors of film music with a long list of full symphonic live to projection projects. He has appeared with some of the world’s leading orchestras including the Chicago Symphony Orchestra, London Philharmonic Orchestra, New York Philharmonic, Philadelphia Orchestra, Philharmonia Orchestra, San Francisco Symphony and Sydney Symphony Orchestra. From full-length movie screenings with live orchestra to music-interactive sporting event experiences to original 3D-environment holiday programming, CineConcerts is at the forefront of live entertainment.